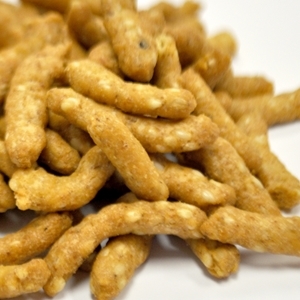 Wholesale Salted Sesame Sticks Sold In 15 Pound Containers. INGREDIENTS: ENRICHED WHEAT FLOUR (UNBLEACHED WHEAT FLOUR, MALTED BARLEY FLOUR, NIACIN, REDUCED IRON, THIAMINE MONONITRATE, RIBOFLAVIN, FOLIC ACID), SOYBEAN OIL, SESAME SEEDS, BULGUR WHEAT, SALT, BEET POWDER (COLOR), TURMERIC (COLOR). ALLERGEN INFORMATION: CONTAINS SOY AND WHEAT.